Classic 1930s American movies seem to have been the inspiration for the interior of this medium-size hotel in the heart of Temple Bar. The Paramount's classy Victorian facade gives way to the flashy wooden entrance, which looks more New York than Dublin. Sadly, the rooms aren't quite as slick, and noise can be an issue. YOU SHOULD KNOW The hotel's Temple Bar location is great and not-so-great for the same reason: it is steps away from Dublin's party central. That means you can almost fall out of the bar into your bed, but it also means that it can be loud. Dark woods and subtle colors decorate the bedrooms, continuing the sleek, elegant look of the hotel - but guests have reported a number of issues, from the lack of air con to tired decor. Some rooms have small balconies, unusual in a city center property. Bathrooms are large and clean, in grey and cream. Some have showers, others showers over baths. The foyer strikes an elegant note with comfortable leather couches, bleached-blond-oak floors, and burgundy curtains. A full Irish breakfast is on offer, although it's not always included in the rate. The good-looking Spanish-themed Turks Head Bar, complete with mosaics, is open until 3am, which is great if you're a night owl, and not so good if you want an undisturbed night (but really, is a hotel in the heart of one of the world's most famous party districts the place for you at all if that's what you're looking for?). It would be hard to be more central, and the Airlink bus to the airport stops nearby too. Quays (4-minute walk) dishes up traditional Irish fare in a pretty traditional setting. Or for an afternoon pick-me-up - or brunch on a weekend - the cutely-named Queen of Tarts (2-minute walk) is just around the corner. The Liquor Rooms (2-minute walk) is a brilliant cocktail bar in the basement of Bono's The Clarence hotel. 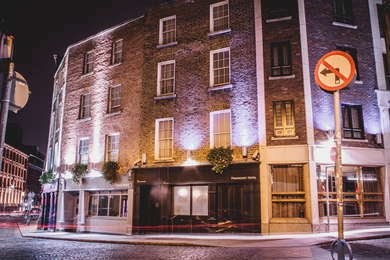 Or enjoy some traditional Irish craic at The Palace Bar (7-minute walk), among the more authentic Temple Bar boozers. Temple Bar doesn't have that many hotels with a bit of class, and Paramount's public spaces at least have that vibe. It's a bit noisy and the rooms themselves aren't quite as stylish, but it's not a bad price to stay right at the heart of the action.